A fungi typically found in the gut could be a key factor in Alzheimer’s disease, scientists say. Candida albicans is pathogenic yeast that lives in the human gastrointestinal tracts. But researchers found that when it was injected into a mouse’s bloodstream, it was able to cross the brain’s protective barrier and triggered inflammation, that eventually caused memory loss. Looking closer, they saw the rodent’s brains had developed tissue structures similar to those seen in people with Alzheimer’s. 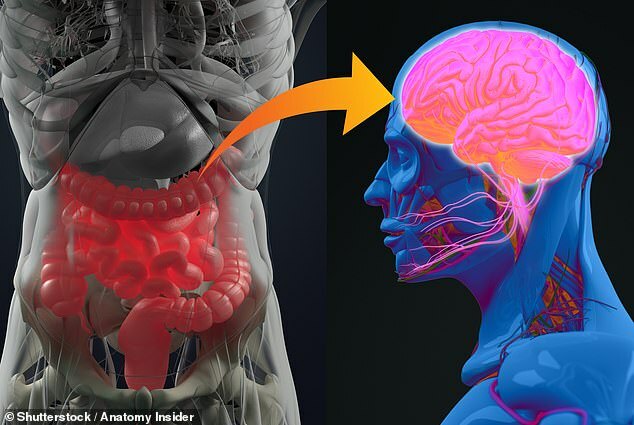 The study is the latest to suggest gut bacteria plays a crucial role in neurodegenerative disease, and offers a clear target for researchers to examine while they work towards a treatment or even a cure. He added fungal infections causing airway allergic diseases and sepsis have been associated with increased risk for dementia later. When entering the brain, the infection formed different tissue-structures – granuloma-type structures – that caused temporary and mild memory impairments. The effect was reversed ten days later when the infection cleared – but some cells remained active. Dr Corry said: ‘We thought that yeast would not enter the brain, but it does. ‘In the brain, the yeast triggered the activity of microglia, a resident type of immune cell. ‘The cells became very active “eating and digesting” the yeast. ‘They also produced a number of molecules that mediated an inflammatory response leading to the capture of the yeasts inside a granule-type structure inside the brain. The study found yeast infected mice had impaired spatial memory, which reversed when the infection cleared. The mice cleared the yeast infection in about 10 days. However, the microglia remained active and the FIGGs persisted well past this point, out to at least day 21. Intriguingly, as the FIGGs formed, amyloid precursor proteins accumulated within the periphery and amyloid beta molecules built up around yeast cells captured at the center of FIGGs. These amyloid molecules are typically found in plaques that are the trademark of Alzheimer’s disease. The team hope the findings will lead to support for future studies on the long-term neurological consequences of this type of yeast infection. Dr Corry said: ‘These findings suggest that the role fungi play in human illness potentially goes well beyond allergic airway disease or sepsis. ‘The results prompted us to consider the possibility that in some cases, fungi could also be involved in the development of chronic neurodegenerative disorders, such as Alzheimer’s, Parkinson’s and multiple sclerosis.